Nothing helps you hang on to your "valuables" and still enjoy hands- free activities like walking your dog- like the Runnur! Is The RUNNUR Only For Walking My Dog? 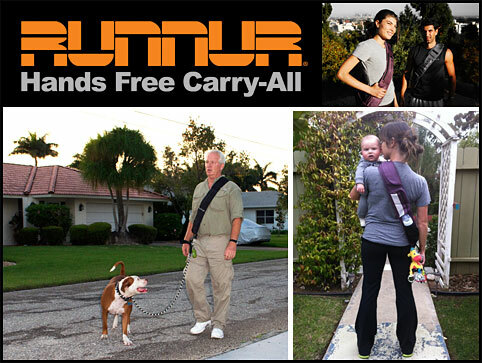 While Runnur is perfect for walking your dog-- or dogs-- you can use it so many ways. Remember that Runnur got it's name from “Running around” or being “On the Go, ” -: Hiking, Travel, Sporting Events, Dog Walking, Festivals, & Urban Commuting. It is a tremendous "hands free" device that you will never want to be without. I Have A Case On My Phone. Will It Still Fit? Yes, most all hard cases will fit. Rubber cases, and larger cases like OtterBox will not. *Larger phones such as Galaxy Note/Android will fit in the passport pocket. What Kind Of Sunglasses Will Fit? Straight face sunglasses and glasses fit easily. Big curved sunglasses like Oakley will not. If you don't use your sunglasses compartment for sunglasses-- I am sure you'll find something else (doggy treats?) to put there. What Do Customers Say About RUNNUR? I enjoy the Runnur for walking my dogs or even riding my horse on the trail! I have 3 dogs and the last thing I need to do when walking them, is to worry about my wallet, sunglasses, water, keys and cell phone. 3 leashes are enough to keep me busy! With GoRunner I don't worry about a thing! My hands are free to just worry about enjoying time with my dogs-- or horse. I was super impressed with the quality of the design-- and how light it was. I recommend Runnur to everyone who would like to enjoy their animals and not worry about the 'little things'. Just A quick note to let you know how much I LOVE the Runnur product!! I was recently at a concert and all my items, cell, keys, money ect was all stored away in the sack. Also, I use it when I bike ride my dogs. I can clip their leash on the corner, and away we go!! Thanks Again, I do love it so!! ? Walking your dog should be fun, but you don't want to be worrying about keys, wallets, chapstick, waterbottles etc. The Runner is well designed and extremely well made to last you for years to come. See why more people rely upon Runnur to enjoy their walking or hiking with their dogs. For more information about RUNNUR and to place your order, please call us today!